← Why can aluminum foil make food packaging bag? 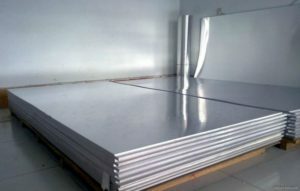 Our first single aluminum Sheet is usually pure aluminum Sheet, aluminum Sheet thickness is 3mm, but in order to reduce weight, improve the strength ofaluminum plate, now used more Aluminum Alloy Sheet , usually choose 21 aluminium (symbol: LF21) rolling aluminum Sheet, the Sheet Aluminum Alloy strength than pure aluminum as high as 1 times. And the thickness of thealuminum plate is reduced from 3mm to 2.5mm. If it has higher requirements for sound insulation and heat preservation, the rock wool, slag wool, glass wool or foam treatment can be placed on the inside of the aluminum plate. So, what’s the problem now, and what should we do with it? The surface treatment methods of aluminum sheet are usually powder electrostatic spraying and fluorocarbon resin paint spraying. 1. electrostatic spraying powder mainly polyurethane or epoxy resin and other raw materials, with high color retention color, you can get dozens of different colors. The powder coating has corrosion resistance, friction resistance and collision resistance, and even under the strong impact, the aluminum Sheet is deformed, and the spraying layer has no crack and no peeling, and is in good condition. The disadvantages of this powder coating is the only UV energy difference, after a prolonged exposure to ultraviolet radiation, after a few years of easy to produce and color, and the powder electrostatic spraying the surface processing method in recent years, basically no longer use. 2. fluorocarbon resin paint is fluorocarbon polymer resin manufacturing paint as finish metal finish, this can resist corrosion (such as acid rain and various air pollutants etc. ), not afraid of the strong ultraviolet radiation, heat and cold tolerance performance is excellent and don’t get dirt in the surface area. It is because of the fluorocarbon resin paint has the good performance, so fluorocarbon aluminum can maintain long-term uniform color and smooth surface and not fade, not because of the sun and subjected to long-term negative and positive effect, service life can last for decades, the single layer aluminum curtain wall is now used by almost all of the fluorocarbon resin paint spraying.